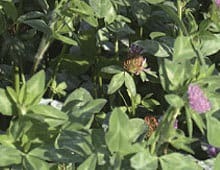 Trifolium pretense L., Red Clover, is an introduced biennial or short-lived perennial that grows as one of two types: medium (double-cut) or mammoth (single-cut). Red Clover plants grow from crowns. Plants have hollow, hairy stems and branches. Stem lengths of medium and mammoth types average 18 inches and 24 to 30 inches, respectively. Medium types have about 4 branches per stem; mammoth have 6. Each leaf consists of a slender stalk bearing 3 leaflets. The taproot of Red Clover is extensively branched. Flowers are borne in compact clusters or heads and are usually rose-pink in color. Seed pods are small, short, and contain kidney-shaped seeds that vary in color from yellow to deep violet. There are approximately 272,000 seeds/pound. Mammoth Red Clover matures later than medium types; only one crop of Mammoth Red Clover is harvested each season since recovery is slow. Red Clover grows best on well-drained loamy soils, but it will also grow on soil that is not as well-drained. Medium and fine textured soils are preferred by the plant over sandy or gravelly soils. It is best adapted to a pH of 6.0 or higher. Red Clover is distributed throughout the United States and Canada.